An additional treasure trove of American history has assembled and is on display in Historic Port Royal. 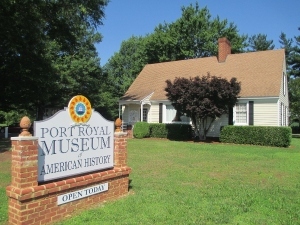 Our collections include historical and cultural topics, items, and artifacts from: multiple US wars; John Wilkes Booth; Native American; Tole Ware; White House China and other U.S. Presidential items; genealogy research; farming and other business/personal enterprise, books, toys, etc. Most items have direct ties to families and significant, historical times in or around Caroline County, some dating back to 1744. Our two largest collections are gifts from The Skinner family of Snowden Road on the Rappahannock River, and Mr. Herbert Collins of the historic Green Falls Plantation, south of Bowling Green. Multiple families and individuals have also gifted or loaned items. Some of the items available in our Gift Shop include books, jams/jellies, flags, children’s games, local handmade soaps, church cookbooks, etc.